What is the Guild Awards Scheme? 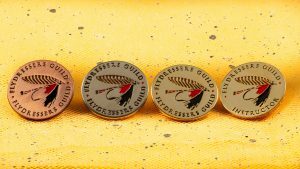 The Guild Awards Scheme is an opportunity for members to test their fly tying abilities against a national standard at their own pace and ultimately receive a recognised award. The scheme is meant to be informative, enjoyable and to encourage co-operation and camaraderie amongst those taking part. Participation is entirely voluntary. No branch or member is under any obligation to take part. All Branch secretaries have received an electronic copy of the Bronze, Silver and Gold syllabii which are also available from the Guild Awards Manager (Richard Ellis – awards@flydressersguild.org) and in the Members’ Area of this website. Branches can use these booklets to design and run their own series of lessons or classes. All Branch Secretaries have been contacted and asked to confirm whether their Branch wants to take part in this scheme and if so, to identify competent and qualified instructors and/ or assessors for each level and register them with the Guild Awards Manager. Branches should register all their instructors and assessors using the form available on the website. They should also ascertain if their instructors and assessors are willing to mentor and assess non-Branch members of the Guild. Branch assessors can award Bronze and Silver level awards to members of their own branch, although where possible instructors should have their own students assessed by another assessor within the branch. Gold awards must be assessed by an assessor who is not a member of the candidate’s branch. Students should keep a record of their progress, which should be available for the assessors to view at the time of completing any assessment (forms will be posted on the Guild website for this). Candidates will be required to present their assessors with three examples of each of the patterns required for the level they are being assessed. Flies sent to the Verification Panel for Silver and Gold awards will be retained by the Guild and become the property of the Guild. With c. 40% of the Guild’s members not being a member of a Branch, and some Branches choosing not to take part in the Awards Scheme, we must also put in place a system whereby non-Branch members can attain our awards. If any member of the Guild who is not a member of a Branch (or is a member of a Branch that is not participating in the Guild Awards Scheme) wishes to take instruction for a particular award level, they should contact the Guild Awards Manager who will arrange for an appropriate instructor to contact them. The instructor will mentor them through the process for that level. The student may be asked to submit flies from time to time for verification that the correct standards are being attained. The student should keep a written record of their progress. Once the student feels ready for an assessment, they should contact the Guild Awards Manager who will arrange for an assessment by an appropriately qualified assessor. Bronze awards may be granted by the candidate’s instructor. For Gold and Silver awards, a different assessor will be arranged. In addition to the Bronze, Silver and Gold Awards, there is also a Grayling award syllabus available as an extra challenge for those who complete the Silver award. Further awards will be published in due course. Electronic versions of the various Awards booklets can be found here. Branches currently running awards schemes have a list of recognised instructors and assessors. Any branch wishing to start an awards programme for the first time should contact the awards manager to make arrangements for the registration of instructors and / or assessors. A list of instructors and assessors is available here or from the Guild Awards Manager. Notes for Instructors and Assessors can be found here. Back in 2007, the Game Anglers Instructors Association (GAIA) was the only body issuing any qualification for fly tying – an instructor’s badge. The Guild’s Executive Committee thought there should also be a qualification for members who wanted to achieve a similar standard of skill through a structured learning programme but did not wish to become instructors, in the same way that students take an exam or degree course but don’t also have to become teachers to get a certificate or qualification. The Guild’s current awards system is based on a pilot scheme developed by the Thames Valley Branch of the Guild. We also drew upon materials prepared to apply for accreditation under the Open College Network (OCN) which would raise fly tying from a “hobby” to an acknowledged skill (NVQ). Whilst the OCN were supportive of this and much work was done towards achieving this objective, it was later decided that the practicalities, logistics and costs involved precluded us from following that route. We would like to thank all those involved in the process of developing the Guild Awards. How do I get started on the scheme? Simply download the booklet from the members’ area and tie the assessment flies. When you have completed them you are ready to submit. How do I get my flies assessed? If you are doing bronze or silver and are in a branch with an assessor you can ask them to do the assessment. They will then notify the awards manager and your certificate will be sent to your branch along with your badge. If you are not a member of a branch, are in a branch with no assessor or do not want to use the branch assessor then send you flies to the guild awards manager who will arrange an assessment. All flies for gold awards must be sent to the awards manager for an external assessment. There is no in branch assessment of gold award flies. What is the cost of doing the scheme? There is no cost to doing the awards and the certificates and badges are sent to you at no cost to you. The costs are covered by your subscription. Any costs of posting your flies to the award manager are for your own account and are not reimbursed. Please ensure you use the correct postage as we do not pay any shortfall and will let the post office return you flies to you. Can I tie a variant of the award syllabus fly? We suggest you stick as closely as possible to the patterns in the booklets. You may substitute a material e.g. orange bucktail for red but you should limit these as much as possible. The syllabus is technique based and this is what the examiner will be looking for you to have demonstrated. Can I appeal against an assessment? We do have an appeal procedure, which in summary involves your flies plus the original assessment being sent anonymously to a second assessor. The outcome of the second assessment is binding on all parties and there is no further appeal process. We would hope this would only be used in exceptional circumstances. I am not an FDG member; may I participate in the award scheme? The scheme and assessment is only open to fully paid up members of the guild. I am an experienced tyer do I have to start at the beginning of the scheme. Yes, the scheme is progressive so with the current awards you need to do bronze, then silver and gold. The only exception is if you are registered APGAI fly tying instructor then you may enter the scheme at gold level. The FDG reserves the right to check that you are APGAI registered with that organisation. I started with the Thames Valley scheme do I have to switch? Any awards given under the Thames Valley scheme will be honoured by the guild with suitable production of paperwork. If you have started a level using the TV syllabus you should complete it and then switch to the new syllabus for the next level. The date for submission of the Thames Valley awards has passed (Closing date was 31/12/2015). Our policy is now only to accept these flies in exceptional circumstances. On the website there is a list of people who have passed the awards – does my name have to go on the roll of honour? The aim of the roll of honour is to recognise the achievement of you passing the examination and as such we hope that all members will agree to have their names on the list. If you do not wish to be on the list you must request this in writing at the time of submitting your awards and then you will not be named on the list of passes. Any requests should be sent to awards@flydressersguild.org. Do I need to tie all the flies in the booklet? In both the older Thames Valley and the newer syllabus there are more flies than are examined. The nonexamination flies are there to provide a challenge and suggestions of materials for club night. You only need to submit the flies on the examination pages – whether you tie anything else is up to you. If you have any doubt as to what is required, please consult the awards manager. I am not in a branch but would like to do the scheme – is this possible? Yes, absolutely the scheme is open to all members of the FDG. If you are confident to tie the flies, then simply go ahead and do them and submit to the awards manager. If you would like some help, then contact the awards manager and we will try and arrange a remote mentor. You can then use Skype etc. and photos to get some help. You will need to send the flies to the awards manager for assessment. I have tied half the flies in a level and now have suffered a medical incident which has left me unable to tie. Can I submit a partially tied award? In exceptional medical circumstances where a level has been completed by more that 50% and there is evidence of having attained the award tying level from other flies the guild awards manager may together with FDG secretary and/or the assessor give a dispensation for the award. This would only happen for illness where there is no realistic prospect of recovery and the guild awards manager may seek a confidential medical opinion on the prospect of recovery. It is not anticipated there will be many uses of this ruling. Yes, the hook size for the woven nymph in the gold award is now size 12. This is because Partridge recently changed their hook sizing.